Nearly 20 months ago, UFC lightweight Nate Diaz (pictured) earned a crack at then-champion Benson Henderson by submitting Jim Miller to post his third straight victory. After coming up short in his lone UFC title bout, Diaz isn’t planning of following a similar path this time around. Instead, the six-year UFC veteran believes he has finally discovered the secret to scoring another shot at the throne without having to technically earn it. “I don’t know,” Diaz responded when asked what was next following Saturday’s first round TKO win over Gray Maynard. “I’m think I’ll sit on the sidelines for a good long, long minute until someone gets injured and fight for a title like everyone else is doing. UFC president Dana White, who was sitting just inches away at the podium, didn’t offer up a response but couldn’t help but giggle at Diaz’s wait-and-see strategy. Diaz was likely taking yet another dig at current 155-pound champ Anthony Pettis, who was handed an opportunity at Henderson’s belt when TJ Grant was forced to bow out of his championship affair against “Smooth” with a concussion. Pettis went on to submit Henderson in under five minutes at UFC 164 in August. He and Diaz have exchanged quite a few pleasantries via Twitter ever since. 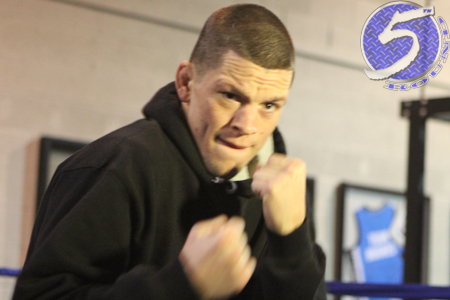 Diaz has come up with a great game plan for landing another title bout. However, chances are UFC brass will never allow him to execute it – particularly since Pettis could be out for up to eight months following knee surgery.